All about the new Geneva Labs sound systems at Totally Wired. All about the new Geneva Labs World Radio and Geneva sound systems at Totally Wired. Geneva from Switzerland design and build a unique family of products with different sizes and finish options to fit into your room design and your lifestyle. The Geneva World Radio is a portable Bluetooth wireless receiver with FM radio and digital alarm clock. Music and radio from anywhere at any time. Do you have fond memories or have romantic notions of the days of the 'wireless'?. Do you have a penchant for classic old world charm or retro styles? Geneva had you in mind when they designed the Geneva World Radio. This is the 2000s and you can have it all. The World Radio is today’s 'wireless' in more than one sense of the word. Pair your Bluetooth enabled device of any kind and listen to your own music or that streamed over the internet – or to radio from anywhere in the world. Also you can receive your favorite FM stations as well. Other music sources can be connected through a line input. Pick it up and go with the curvy flip down carry handle. It’s light–weight so easy to carry around. Yet it sits securely on it’'s rubber base. Be free of cables and take your radio with you. The Geneva World Radio can run off it’s rechargeable lithium battery for around 6 hours. Geveva Labs have earned respect not just for having a 'pretty face'. The Geneva sound is their success and what you’'ll love your Geneva for. 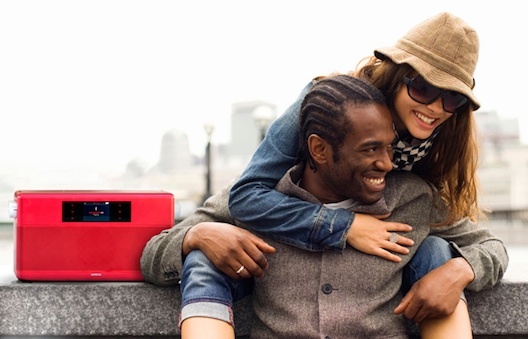 The World Radio has a powerful 3" speaker driver that produces not only a full clear sound but sound that fills space. Geneva’s 'patented Embracing Sound DSP' technology is how they achieve this. Listen to any Geneva and you’ll hear a wide dispersion of sound from a surprisingly small device. 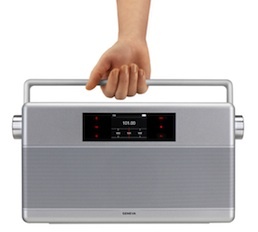 Designed and engineered by the Geneva team in Switzerland the World Radio was clearly inspired by the iconic Dieter Rams Braun radio of the early 60s. Geneva’'s modern streamlined version is elegant with tactile soft edges and touch controls. Push the left knob to switch it on or off; rotate to adjust the volume. Push the right knob to scan FM radio stations or rotate to dial through the frequencies. 'RDS' means the screen will give you the name of the stations when you hit them (or at least the ones that broadcast that information such as 'National' and 'Concert'). When scanning the frequencies the screen delightfully shows up as a frequencies band with a red marker just like an old style radio. 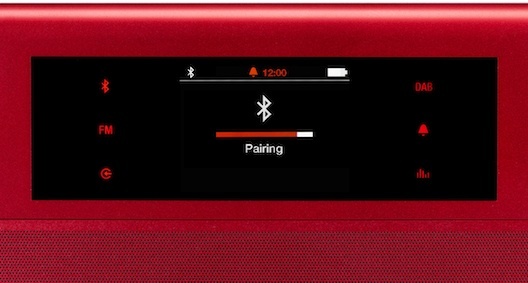 Touch button controls on each side of the screen take you through the listening modes – bluetooth, FM or line in, whilst the right side ones have the alarm clock functions as well as bass and treble tone controls. Geneva’s make great gifts! We can gift wrap; send directly to the recipient (and send you the receipt of course); we can enclose an exchange card if you’re not sure about the colour; or we can simply do gift cards if you want your recipient to choose their own colour. Ask about corporate bulk orders. Use our 3 month lay–by plan. It’s easy with internet banking. Just email us with your order and we’ll reply with details. Your purchase will indirectly help the survival of New Zealand’s special Hector Dolphins.Totally Wired support World Wide Fund for Nature and Save Animals from Exploitation. Find out more here. Cool as they look, it's the sound quality that sells Geneva. You can come in and hear Geneva systems for yourself, right now. We've been hugely impressed - there are few small systems that rival Tivoli but with the Geneva World Radio, S and M systems, you get to make that choice. The larger models - L and XL are another ball-game completely and present a very real challenge to conventional hifi systems. Call us now to find out more.